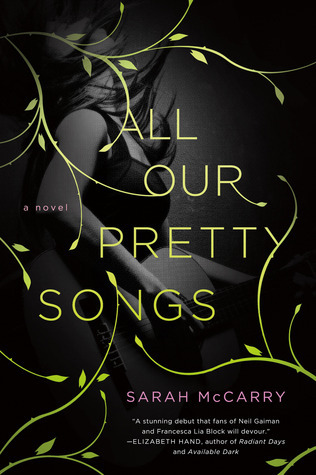 All Our Pretty Songs by Sarah McCarry. St. Martin’s Griffin, 2013. Currently Available. Face Value: At first I like it, the leaves and the font and everything, but when you look closer and see the floating girl I am less interested. But it could certainly be worse. There are moments where these characters perform non-Slatebreaking actions, but my ultimate read on it after finishing the book was that it was part of a larger, Slatebreaking narrative. Who would we give it to? I’d recommend this book to readers of Francesca Lia Block or Nova Ren Suma. The prose is beautiful, lyrical, and almost stream-of-consciousness at times, so if you like your narrative straightforward, this isn’t the book for you. But for readers who are willing to get lost in language as the story unfolds, this book will definitely have appeal. Review: In an unnamed town in the Pacific Northwest, two friends have grown up like sisters. The beautiful, mercurial Aurora and the never-named narrator have grown up together with their lives intertwined. Nothing can come between them – until something (someone) does. A musician named Jack appears, and he and the narrator fall in love. But then, after a party fueled by drugs, and possibly magic, a man named Minos offers him the kind of fame and exposure he could only dream about. He and Aurora leave, and its up to the narrator to go and rescue them. It would be easy for this to be a book about a romance that tears apart a friendship. But it’s so much more than that. The friendship between Aurora and the narrator goes deep – and ultimately it is Aurora that the narrator goes to save, not Jack. There’s also a complicated portrait of the friendship that ended between the girls’ mothers, and how it’s more multi-faceted than it originally seemed. “Aurora is sunlight and I’m a walking scowl. Aurora’s skin is dark, and mine is watery cream, She bleaches her black hair white and smokes unfiltered Lucky Strikes and drinks too much. She wears dresses made out of white lace and gloves with the fingers cut off. Converse with holes at the toes and old-lady satin pumps, and if you think right now of the most beautiful girl you know, Aurora next to that gilr is a galazy dwarfing an ordinary sun. We construct our identities out of clothing, material items – we all do, and while I am likely to flinch at a character being entirely defined by her clothing aesthetic I like this treatment of it. I like the way Aurora can be powerful in dresses and the narrator can be powerful in combat boots, and they take strength from performing the identities that make them feel safe and themselves. And so, despite the fact that these characters get lost along the way, they are Slatebreakers. And even though the narrative unfolds in a drug-and-art-fueled stream of consciousness, the language is beautiful, and the story itself is absolutely worth reading. This entry was posted in Reviews, Young Adult and tagged Art, drugs, Fantasy, Friendship, Music, Myth, Orpheus, Pacific Northwest, Retelling. Bookmark the permalink.